A beluga whale that has taken up residence in the River Thames cannot be hauled out, experts have said. 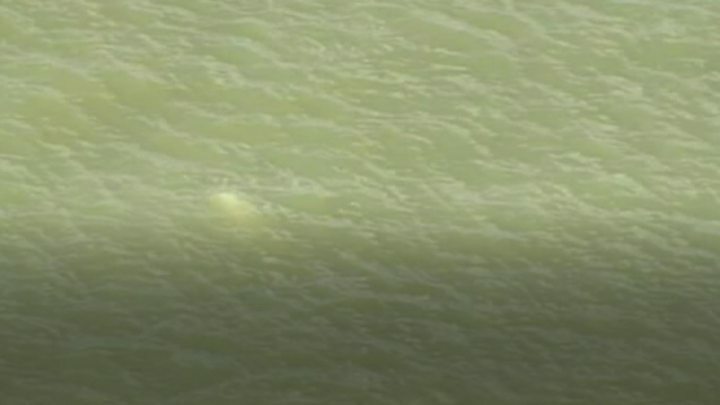 "Benny the beluga" was first spotted near Kent on 25 September, where it remains swimming and foraging for fish. British Divers Marine Life Rescue (BDMLR) have dropped a hydrophone in the water to try to track the whale. Operations manager Stephen Marsh said netting Benny to set it free was too high risk and not an option, and experts could only observe and protect. "People have been saying 'why don't you haul this out and do something with it', but we can't do that," Mr Marsh said. "We know that netting an animal isn't safe." Image caption Benny the beluga is still "swimming strongly"
He said beluga could be caught and it was known the Russians caught them to sell them into the captive trade, but he added: "We don't know how many of those animals actually die, so that's not a risk that we're willing to take." So far, the whale - nicknamed Benny on social media - has remained in the Kent stretch of the river, where he is feeding near barges, the Port of London Authority has said. 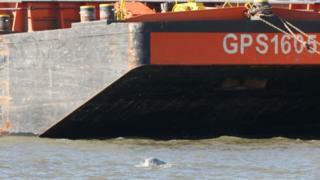 The whale has not yet ventured as far as the capital or anywhere near the Dartford crossing. At BDMLR, Mr Marsh said his team had consulted beluga experts in Canada about Benny's visit, a phenomenon he described as "a very spectacular and very strange occurrence". Experts are clear they do not want to put the whale at risk or see it end up in captivity. "It's a wild, wild animal," Mr Marsh said. "It's probably come down here maybe 1,400, 1,500 maybe 2,000 km away. "It's been fit enough to do that already. We're hoping that it's fit enough either to stay around in London or find its own way back to the open sea. "For the time being, it very much is a case of observe and protect." Sound recordings captured by the hydrophone have already provided some data. Experts are now analysing the sounds and trying to link them to sightings to try to track Benny and find out if he is feeding and to build up a picture of his overall health.